Not only don’t we have a teacher shortage, but we have an abundance. Some folks love a good scare. Y2K, the population bomb, mad cow disease, Salem witches, etc. They seem to add spice to life. 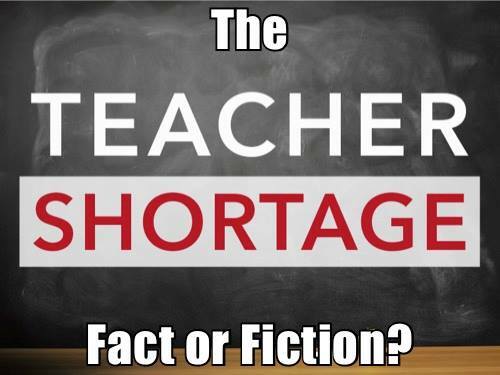 I think we can officially add “the nationwide teacher shortage” to the list. But as always, facts and data are the Grinches that spoil the fun. So when the fear mongers sound alarm bells, warning us that we have a nationwide teacher shortage and it’s going to get worse, just what actual evidence do they offer? Well, very little. The claim of a catastrophe usually revolves around the fact that some school districts are short on teachers generally and some may lack teachers with certain areas of expertise, like science or math. But a teacher shortage writ large? The data says absolutely not. Many have exploded and exploited that myth over the years. Presently, according to a new report by the U.S. Department of Education, our teaching force is still growing proportionate to student population. In fact, we now have over 3.8 million public school teachers in the U.S., an increase of 13 percent in the last four years. During that same time period, student enrollment rose just 2 percent. Mike Antonucci, director of the Education Intelligence Agency, adds that between 2008 and 2016, student enrollment was flat but the teaching force grew from 3.4 million to over 3.8 million, a rise of 12.4 percent. Worse yet, it’s not only the teaching force that’s ballooning; the number of other school employees has been metastasizing at an alarming pace as well. Researcher and economics professor Benjamin Scafidi found that between 1950 and 2015, the number of teachers increased about 2.5 times as fast as the uptick in students. But even more outrageous is that fact other education employees – administrators, teacher aides, counselors, social workers, etc. – rose more than 7 times the increase in students. Scafidi adds that despite the staffing surge, students’ academic achievement has stagnated or even fallen over the past several decades. California seems to be following the national trend in overstaffing. According to the Legislative Analyst’s Office, California had 332,640 teachers in 2010. By 2015-16, there were 352,000. But the student population has been virtually flat, moving from 6.22 million in 2010-11 to 6.23 million in 2016-17. My home town of Los Angeles, trendy as always, is keeping up with the current fashion. Over the last year the number of school employees was basically flat, rising from 60,191 to 60,240. But at the same time, the student population decreased by 40,000, a 6 percent drop. As the National Council on Teacher Quality points out, workers in these fields earn higher salaries in the private sector. Accordingly, one solution would be to pay them more as a way to lure them into teaching. Of course, that’s not doable because throughout much of the country and certainly in California, we have a teacher union-orchestrated step-and-column pay regimen, which allows no room for any flexibility in teacher pay. Sounds jaw-dropping right? But all that really means is that, if we have a 3 percent yearly attrition rate, just to maintain the current level will need to hire 10,000 teachers per annum over a ten-year period. Hardly worth a raised eyebrow. The CTA tellingly adds that we need to hire even more teachers to “reduce class size so teachers can devote more time to each student.” Yup. The fallacious claim that small class size benefits all students – another union myth – means more teachers, which translates to more dues money for the union. What we need to do more than anything is to break up the unaccountable Big Guv-Big Union complex. More privatization – running schools like a business – would go a long way toward solving the teacher glut. You see, the edu-blob always wants as much money as it can successfully squeeze from the taxpayers. It has nothing to do with teacher shortages, small class sizes or any other cockamamie excuse it can come up with. It means more jobs for bureaucrats and more dues money for the unions, which the bosses use to line their own pockets and buy and hold sway over school boards and legislators. So while teachers may not be in short supply, veracity and forthrightness in the education establishment are sinking to crisis levels. Larry Sand, a former classroom teacher, is the president of the non-profit California Teachers Empowerment Network. The views presented here are strictly his own.